On October 19th in Great Hills Park I photographed this little hover fly on some flowers of frostweed, Verbesina virginica. This is the third post in two days that refers to Virginia, even though I photographed both of the relevant plants in Austin, where they’re also native. Beautiful! I live in VA and am enjoying your TX plants with VA references. The fly is a nice touch. Now the question is whether you have any plants native to Virginia that have Texas in their names. oooooooooooooooooooooooooOOOO I like this one, something about the shapes and colors and lines yum! It’s nice on an overcast and cold morning to see all those warmly enthusiastic oooooooooooooooooooooooooOOOOs. Exquisite little jewel of an insect. Makes me think of Faberge. That’s a good description, a jewel of an insect. I wonder if there’s ever been a human jeweler named Hoverfly, or an insect named Fabergé, for that matter. There have been insects created by Fabergé. There should be an insect named Faberge. See if you can convince an entomologist who’s working in an area where new species are being discovered. I like the compound eyes. I’m glad to see you have an interest in them. Let’s call it compound interest. That’s for sure. The almost-zero interest rate that the government has imposed for the last six years is a kind of tax on those of us who lived within our means and dutifully saved money to support ourselves later on. The farther you go…the behinder you get. Beautiful! I enjoyed Gallivanta’s comment and your response. Exactly my thought when I clicked on over. As always, I’m thankful for my macro lens because these insects are small enough that the unaided human eye can’t appreciate all their details. That is a very cool little Syrphid, Steve. Besides the nice detail in the compound eyes, I like the sheen and patterning in the wings also. That iridescent sheen even adds a little bit of color, some of it akin to the attractive (figuratively and literally) red eyes that draw our human eyes to them. I don’t know why this fly often curves its abdomen downward, as shown here. I’ve a very nice image of a hover fly on a daisy fleabane with a nice prismatic sheen, but I don’t have it on the website so can’t link to it. Maybe we need to have a syrphidoff next. Like Davidoff and Stroganoff, Syrphidoff sounds like a Russian family name. If you’re so inclined, you can turn your hover fly picture into a post. … of a great little fly. I’m glad you like the words and the picture, eLPy. Here in Austin I haven’t seen any frost yet, though there may have been a little on some of the cold mornings that have dawned here in the past week. If the temperature drops a few degrees below freezing, some of the frostweed plants will do their picturesque ice trick, which a northern reader reports already having seen and photographed. Gosh you’re quick with the links eh? And thank you for that, those frost flowers are AMAZING! First thing I said when I looked at them was, what the heck (or something to that effect ;)) am I looking at? You’re right they are pretty lucky, fortunate, to have discovered those. Really incredible stuff, thank you! Love those wings, a most beautiful prismatic reflection I have seen for a while! Outstanding capture, I must mention those big red eyes also, all the details are just fabulous! Yes, it’s quite a cute little creature, and those big red eyes are a real attention-getter, very different from when people have red eyes. The weather surely has changed in just under a month. This photo looks so warm and summery — not at all what we’re experiencing tonight. I thought I was ready for winter, but I’m not quite so certain at this point. I saw your mention up above of frostweed splitting in places farther north. We’re clearly in for another bout of cold, and it may be that the inland frostweed stands I found in Brazoria County will be my best chance to see the phenomenon this year. If it’s too cold to work Tuesday morning, I may go trekking. Oh, what a difference there’s been since the warm Monday we had just six days ago. I’m never ready for winter (that’s one reason I moved to Texas), so I hope this early cold spell (as much as 20° below average here for this time of year) isn’t an omen of an unusually cold season to come. Gook luck on trekking and tracking down some frostweed doing its thing this year. Too cold to work may be cold enough for ribbons of ice. I haven’t seen any in Austin yet this year, and I don’t think the overnight low in my neighborhood has been cold enough—either that, or I missed my first opportunity of the season. I hope you get to see (and photograph) insects like this one in Montana. 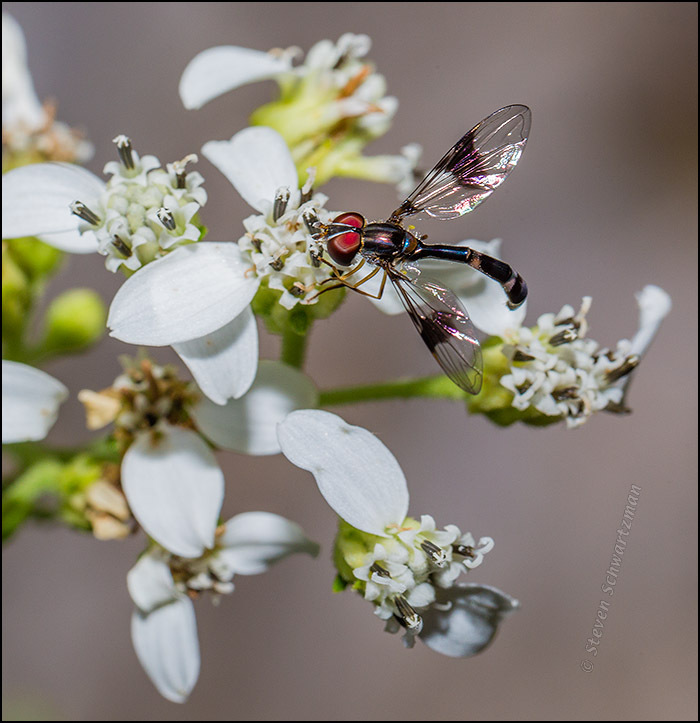 Love the detail and the delicate petals and fiery colors of the Hover fly. Great shot, great work. Thanks for your appreciation. The hover fly’s eyes are quite an attention-getter. What showy wings! A mighty handsome creature, that. I’m always glad when I see these little hover flies, and this one had bigger and more colorful eyes than most. Photographing them is tricky, though, so I was grateful for getting a few shots that came out okay. So pretty, those flies. They are under-appreciated, except perhaps by me. That hover fly is so colorful. I can imagine it copied for a nature-lover’s brooch. If you know any brooch makers, you’re welcome to broach the subject. I am having a good browse through your site Steve as I have just taken delivery of a macro lens and need expert tuition! Actually I need expert tuition for using a camera with interchangeable lenses having spent the last ten years with a digital bridge camera. Your techniques page has already been bookmarked and scrutinized, I shall be visiting it often. Have just been outside to have my first practice with very mixed results! What on earth have I done? That’s good news about the arrival of a macro lens, which I’m sure you’ll come to enjoy once you get the hang of it. As you’ve no doubt noticed, the closer you get to a subject, the more it seems to move about and the shallower the depth of field. Some photographers deal with those drawbacks by putting their camera on a tripod. I’ve chosen to stay in the hand-held world, but I use a shutter speed of at least 1/400 sec to try to freeze any small movements. If you have any specific questions, ask away, and if I know the answer I’ll tell you. When I chose Portraits of Wildflowers as the name for this blog, I always intended for some of my subjects to come from the broader realm of nature—especially because insects and spiders often appear on plants. The fact that so many of the favorite pictures here include animals doesn’t surprise me: it reflects the preference of my audience in particular and blog audiences in general. One consequence of that is that if you go through blogs and come across a picture of a butterfly, for example, even if not a good picture, it will usually get a lot of likes, while a finely crafted and hard-to-take photograph of a seed or dying plant or some other thing that’s less intrinsically interesting to the general public will get noticeably fewer likes. My impression is that there are a fair number of blogs about gardening but few about plants from a scientific or artistic point of view. You’re sure right about the focus moving about A LOT when you get near a subject with a macro lens. It’s also the case that a camera’s auto-focus system doesn’t function well very close to a subject. I don’t know about your camera/lens, but mine lets me use auto-focus to quickly get “in the ballpark” and then turn the lens barrel to fine-tune that initial auto-focus (that’s sometimes called manual override of the auto-focus). If I anticipate that auto-focus isn’t going to work well in a situation, I switch to manual focus from the outset. Mmm… I don’t know enough about the lens (or camera) yet, but I don’t think I can override the autofocus, but I can set it to manual, which I may well do for a while and see how that goes. I know you rarely use a tripod, but maybe I’m going to have to try that method too. Should be fun experimenting, but I may not publish another flower photo for a while! That’s a plan: have fun experimenting and then post pictures that are successes.